Read Also : How to create a password file in WinRAR ZIP. this is useful if you care about your personal documents residing on the computer and want to create a password on the file. With the development of Smartphones today, not just a laptop that can open two windows on the monitor, Smartphones are now equipped with advanced technology that can create two separate screens on a monitor like a computer, well this is the advantage that lets you rewrite articles on Smartphone. Doing typing activity by looking at other posts can be called (Rewrite Articles). This method is often done blogger authors to avoid Copas. By doing a good rewrite can be sure the article can compete on the google homepage. Not all smartphones can display 2 screens only certain hp can do it. For you who already have a smartphone with two display screen feature you can try the way below. You start by displaying the articles that you will re-write using your existing smartphone app browser. Then close the first screen by pressing the home button, then you open another browser application to log in to the blogger site and then click the new post. to display 2 screens on your smartphone, you can press the active window button on the smartphone screen located under the right corner. open the first browser and press and scroll up, Until this stage is already open one screen. To display 2 screens you just select another active window and press. 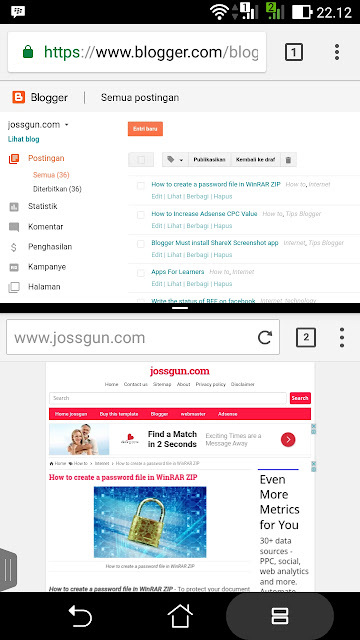 Now you can start rewriting the article by displaying two screens on the smartphone. To restore the screen that appears you just need to move the screen above and drag the screen down.